In his most ambitious television documentary project yet, Ian Hislop asks when and why we British have bottled up or let out our feelings and how this has affected our history. Revealing as much about ourselves today as about our past, this is a narrative history of emotion and identity over the last three hundred years, packed with extraordinary characters, fascinating vignettes and much humour, illuminated through the lens of culture – novels, paintings, magazines, cartoons, film and television – from which Ian gives his personal take on our evolving national character. Far from being part of our cultural DNA, emotional restraint was a relatively recent national trait. Foreigners in Tudor England couldn’t believe how touchy-feely we could be – ‘wherever you move there is nothing but kisses’ wrote a shocked Erasmus. 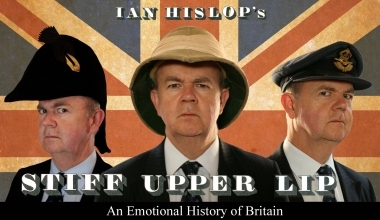 In this opening episode, Ian Hislop charts how and why the Stiff Upper Lip emerged in the late 18th and early 19th century in a country till then often awash with sentiment.